Content - American Audio ELS 8GO LTW: Play Music Anywhere With A Built-in Lightshow! American Audio ELS 8GO LTW: Play Music Anywhere With A Built-in Lightshow! There are lots of circumstances where a portable PA could come in handy. Perhaps you’re an emcee in need of a pop-up microphone system for outdoor events? Or maybe a musician looking to amplify your sound for busking or impromptu shows? Or even a DJ looking for a way to play music for cocktail hours hosted outdoors away from mains power sockets? Maybe you just want to play tunes at a pool party, picnic or backyard boogie. The brand new ELS 8GO LTW from American Audio is the perfect solution for all of these situations, offering a compact and feature-packed portable audio system with an extremely affordable price tag. Featuring an internal rechargeable battery, the ELS 8GO LTW is a lightweight active 2-way speaker featuring an 8-inch woofer. Housed in a compact molded-plastic case, this feature-rich PA solution also boasts an in-built media player, wireless mic receiver, multi-input mixer, and even an LED lightshow arranged around the main speaker driver, making it a flexible tool that is ideal for any situation where music and speech need to be amplified free of cables. The unit is supplied as standard with a wireless microphone, which means that just this one product can be used for vocal performances and to make announcements without the need for any other equipment and not a single cable. The speaker can run for a considerable length of time powered solely by its internal battery and a set of four status indication LEDs on the rear panel give instant visual confirmation of the remaining power supply. A 13.2V DC power adaptor is then provided for charging the unit, and also to allow it to run from mains power if required. The ELS 8GO LTW’s flexible internal music player allows audio playback from a wide variety of sources. It features an SD memory card slot, as well as a USB socket for the connection of flash drives, and can also be connected wirelessly to devices such as smart phones and tablets. A four-digit LED display screen and set of five control push buttons facilitate track selection and playback, while a separate remote control (supplied as standard) allows playback to be triggered from a distance. In addition to its internal music player and wireless mic, the ELS 8GO LTW offers a number of connections for external audio sources, further adding to its flexibility. A dedicated mic input is provided via a 1/4” jack socket, as is a dedicated Guitar connection. Both of these inputs have their own rotary level controls which means that the level of the internal music player, mic, and external inputs can be balanced without the need for a separate mixer. In addition, a stereo 1/8” jack socket is also provided for the connection of a laptop, mp3 player, or even a DJ mixer. Meanwhile, a further 1/4” jack socket is provided as a Line Out, which can be used to daisy chain together multiple speakers to create a larger PA system. 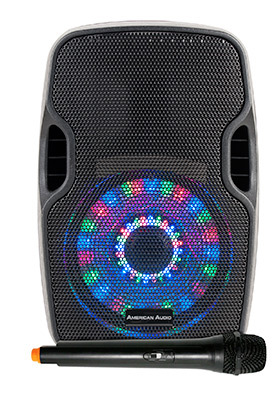 The LEDs arranged around the speaker’s woofer mean that the unit can also be used as part of a DJ or performer’s lightshow. The effect is sound active and features a mixture of red, green, and blue LEDs that create exciting visual effects. To save battery power, or for applications where it isn’t appropriate, the LED effect can be disabled using a switch on the rear panel. When not in use, the LEDs aren’t clearly visible on the front of the unit, which means that it is a true added bonus effect – available if you want to use it, but hidden if you don’t. With measurements of 11.6” x 9.6” x 17.125” (295 x 245 x 435mm) the ELS 8GO LTW is very compact, making it easy to store and transport. At 22 lbs. (10kgs) it is also lightweight, meaning that it is ideal for use by mobile entertainers and other event professionals on the go. It features a locking stand mount, for use with a standard speaker tripod, but can also be placed directly on any sturdy table or similar surface. 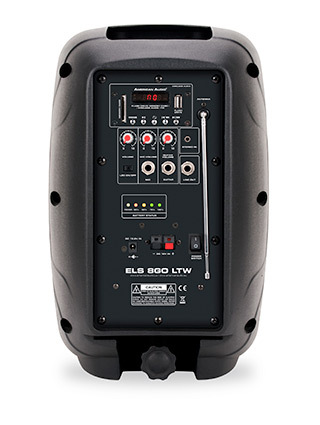 Generating a maximum SPL of 93 ±2 dB (1W/1M) and with a frequency response of 85Hz – 20 kHz, the ELS 8GO LTW is capable of filling a reasonably-sized space with rich and detailed sound. Meanwhile multiple units can be linked together using the Line Out socket to create a system capable of covering an even wider area. If you’re looking for a flexible and affordable wireless speaker system that is equally suited to music playback as it is to amplifying speech, look no further than the new American Audio ELS 8GO LTW. Offering powerful amplification, in-built rechargeable battery, integrated music player, and plenty of connectivity options, this flexible unit has all the bases covered and, with a price tag of just $99, you really can’t go wrong!